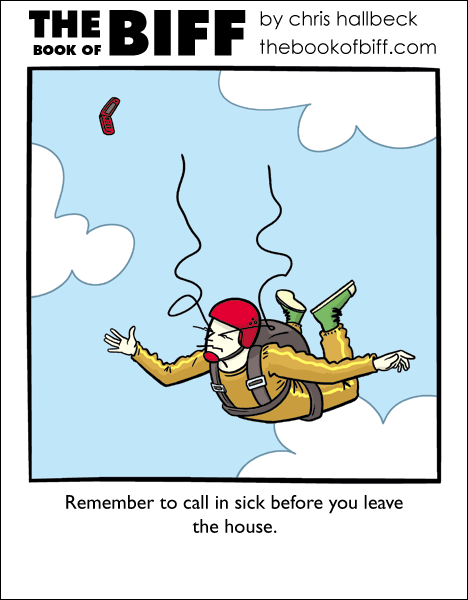 Have you ever called in sick to school or work but you were not actually sick? What did you do with your day off? Biff Xmas cards in the store! Took care of someone who was sick. Haven’t done so any other time. Yeah, that felt a little bit weird. Once every so often I tend to stay home from work. Mostly it’s to catch up on sleep. Women come in as a good second reason. Believe it or not, my mom would make me. Wierd thing was she never drove me to school, either. From 4th grade straight through High School I walked to and from. So basically her getting sick was a freebie card for me to stay home and play video games all day. This is a very timely comic. I stayed home from school today, and pretty much all I did was surf around online and talk to people. Also, I washed dishes. …. *reads some of these comments*…. I have no words with that. The time I ever did this was mostly in fourth grade. My teacher was abusive, physically and emotionally (and, as I look back at it now, she probably broke several laws in her course of student abuse), and I couldn’t stand going. Since then I’ve not called in sick unless I really was sick. I don’t care to get fired–at my last job oh so many coworkers were fired for calling in and then being seen in public later in the day. We had to write a first term math test, but I realized I dont know anything. So I stayed at home and spent the Friday and the weekend learning math. Aww. All at all, I got ‘F’ mark next week. And a month before school leaving exams I called in sick and went geocaching, cos I was fed up with the people in school and wanted to see some nature. I have to agree with Libramen, I have panic fits on days I stay home. I loathe missing school right now because I’m a senior, and let’s face it I shouldn’t be missing as many days as I have. Only one day I’ve missed so far has been a freebie, and that was for senior pictures. Well you know. In college I would call in sick to class on days more important things were happening. I.E. a really cool concert in Rochester! But then again in college if you miss class its typically not that big of a deal. Just make up your work. School? Oh yeah. Quite often. And then I’d play video games or chat online all day. Nowadays, when I call in sick to work, it’s due to emotional exhaustion, so I sleep all day. Go, Go Emergency Departments! Last time I called in without having reason, it was to spend some time with the girl I’m now dating. ^_^ Good call on my part! The closest that happened to me was after a week of having the flu on the friday at about 11:00 am I suddenly felt compleatly fine, and my weekend promptly begain. This was about a bi-monthly conversation in elementary school. Just like ZeoViolet, I had an abusive teacher, only mine was in fifth grade. Since my parents closed their store on Mondays and slept in, so did I. More recently, when I was leaving a government job where I would lose all of my several hundred hours of sick leave, I somehow found that I never felt very well on Friday afternoon or Monday morning. I friend of mine used a sick day before to come with us to an event. He barely dodged a bullet, they almost made him come in, but we were in another city. Oh, ALL THE TIME. At least once a month. I get tired, or just don’t want to get out of bed. My job is boring and half the time I have little to nothing to do so why not? I have the hours (we get 16 hours each month) so no harm no foul… Oh did I mention I work for the State (i.e. no worries about being fired or being checked up on – only if you miss 3 consecutive days). Oh yeah. I called in sick because even though I asked for the time off a month before scheduled me on the second day of my local anime convention. There was a voice acting panel on that second day that I surely wasn’t going to miss. It is my dream job. I phoned in sick using my voice acting talent and made them believe that I had strep throat so I wouldn’t be able to work. I was even able to fake getting better 3 days later. I usually have to spend my sick days…actually sick. I get sick easily. to those of you that go to work/school when sick because you panic otherwise.please stay home. Absent from soc class…spent hours at the garage with my near terminal car, did feel kind of sick after. Don’t sick call much for work, but when I do its to sleep…night shift at UPS = sleep crave. called in sick one day because i just didn’t feel like working. 8 hours later i came down with swine flu. I’ve called in sick to work a few times. Mostly to spend time with friends and family, or go to concerts. Sometimes just because I need to take a “mental health day”, and spend an entire day doing nothing. @Aaarrrgh : What you’re feeling is called hypocrisy. Well, mine is the most tragic…I was staying home from school on a mental health day. 9/11 happened, so I got a good view of the Twin Towers burning even though I live in Washington. Can’t seem to think that H1N1 would actually seem more tragic than that. I was never able to just call in sick for school as since my mum is a pharmacist, whenever i tried to say that i wasn’t feeling well to get her to call the school, she would just go to the medicine cabinet get out about 10 different tablets, all of which tasted absolutely disgusting, and told me to take the tablets and we were leaving in half an hour… But on the bright side, whenever i had any kind of sports day, i just got her to write me a sick note and i could just mess around at home. Well, for me… I usually spend the day in mental recovery. aka rocking out to loud music and playing video games for hours on end. I guess sometimes I just have to feed the addiction. I’ve done it in the past, haven’t done it with any of the jobs I’ve had recently. When I was in High School, I had first and second period Co-op, where I was supposed to go work a job as a class, but the co-op job I worked for didn’t open until 11am, which was when second period was almost over. So I ended up doing my co-op after work, meaning I got to sleep in until lunch. But, since my dad was the principal of my school, I often called him and said, dad, I don’t feel well, I won’t be coming in today, and for a while he was ok. Then he started to tell me I had to come in. And most of the time I’ve called in sick when I wasn’t, I’d sleep in, then play video games or play guitar or something. I called in sick once. I had a sore throat, but not bad enough to stay home. I consider it to be a Technicality.